A Maksutov-Newtonian can provide an excellent alternative to an apochromat refractor for lunar and planetary observing and imaging. 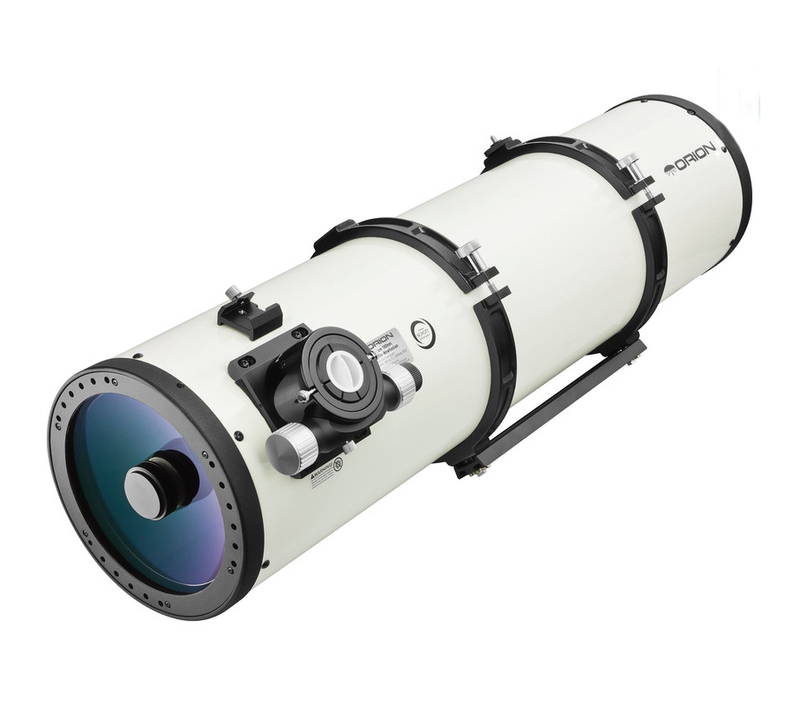 With apertures of typically 150 to 190 mm they would cost significantly less than the same aperture apo refractor. A downside is a greater weight, so perhaps a more expensive mount would be needed. The Maksutov-Newtonian will be the same size as an equivalent aperture and focal length Newtonian but, instead of using a parabolic primary mirror, employs a spherical mirror allied to a thick, curved, meniscus lens at the front of the optical tube. This corrects for the spherical aberration of the primary mirror but also significantly reduces the coma that would be seen towards the edge of the field of view of a low power eyepiece. The fact that the secondary mirror is not supported by a spider eliminates the diffraction spikes that would be seen in a Newtonian − helping to increase the ‘micro contrast’ of the image. In both Newtonians and Macksutov-Newtonians there is always a design compromise in specifying the diameter of the secondary mirror. If, without an eyepiece, one observes from the centre of the focuser, one will see the whole of the mirror, so that all the light collected by the mirror will help to form the image there. As one moves one’s eye away from the centre of the focuser it is likely that less of the mirror will be seen as in the image below. This means that away from the centre of the field of view the image will become less bright – an effect termed vignetting. A view of a Newtonian mirror seen from the centre of the field of view and offset from the centre where the image will be vignetted. The smaller the secondary mirror, the greater the vignetting that will be observed. One might simply specify a secondary mirror size so that no vignetting occurs and this may well be the case when wide field observing and imaging is the prime task of the telescope. However the larger the diameter of the secondary obstruction to the light path, the more light is taken away from the central disk of the Airy pattern and moved into the surrounding rings thus reducing the effective resolution of the telescope and the micro contrast in the image. So if one were to specify a secondary mirror for planetary observing and imaging, where the image can be kept in the centre of the field, a secondary mirror just large enough to avoid vignetting in the field centre would be used. As Macksutov-Newtonians are perhaps better suited to lunar and planetary observing (along with small angular sized objects such as planetary nebulae, globular clusters and distant galaxies) they tend to be specified with relatively small secondary mirrors so that, perhaps, only the central 10 mm diameter of the image plane is unvignetted. These are provided by three companies, Skywatcher and Orion (USA) manufactured in China by Synta (and thus likely to be very similar) and Intes-Micro, manufactured in Russia. 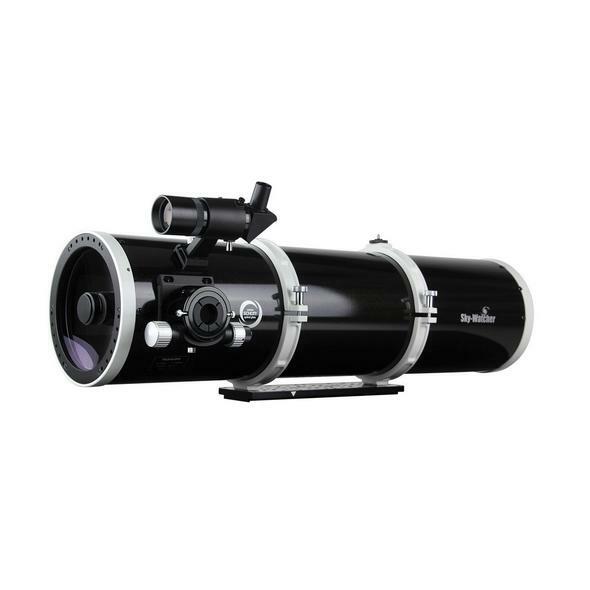 The Skywatcher Explorer 190 Maksutov-Newtonian DS-PRO, f/5.3, telescope is, costing typically £1,050, great value for money and should give images comparable to a 150 mm apo refractor at a fraction of the cost. It employs a low-expansion Pyrex primary mirror and multi-coated Schott BK7 front meniscus lens. The secondary mirror has a diameter of 50 mm giving a 26% obstruction. Internal knife-edge baffles reduce internal reflections to give increased contrast. A two-inch Dual-Speed Crayford focuser is used which will support CCD and DSLR cameras with the usual accessories. To prevent flexing, the tube assembly is made of 1.5mm thick metal tubing. The weight of Optical Tube Assembly is 10kg (22lb). This is, I suspect, similar to the Skywatcher telescope having a f/5.3 focal ration in a 37.5 optical tube assembly incorporating five knife-edge baffles to aid contrast. The dual-speed 2″ Crayford-style focuser should provide smooth motion and secure support for cameras. [Elsewhere in this digest I have pointed out that many refractors now have helical rack and pinion focusers to prevent focus creep particularly at high elevations. 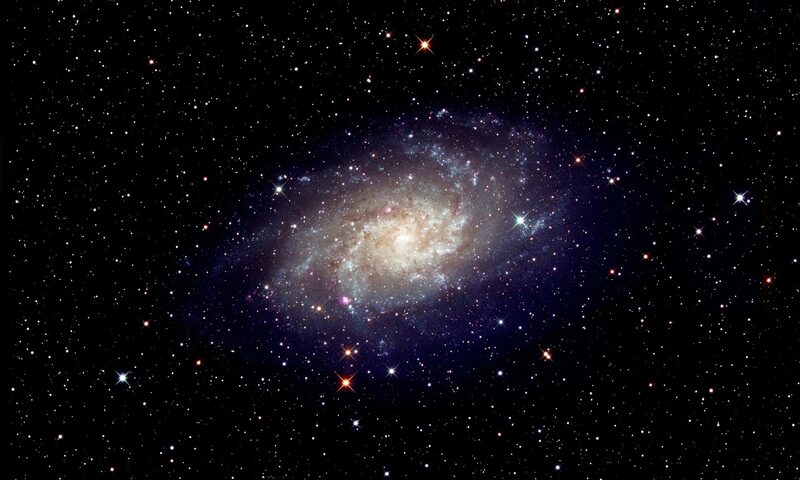 However in the case of a Maksutov-Newtonian the focuser and cameras can be aligned horizontally so the use of a Crayford focuser would not be a problem.] The focuser includes 2″ and 1.25″ compression ring adapters and is now compatible with the Orion AccuFocus Electronic Focuser. A T-thread adapter for direct attachment of a camera body (may require appropriate T-ring, sold separately) to the telescope’s focuser, is also included. The primary mirror is made of high-grade, low-expansion optical glass with enhanced reflectivity coatings coupled to the fully multi-coated BK7 meniscus lens. The 37.5″-long metal tube contains five knife-edge baffles for exceptional contrast. Compared to the Skywatcher, the diameter of the secondary mirror is 64 mm (a 33% obstruction) rather than 50 mm. Whilst reducing the micro contrast somewhat, this substantially increases the field illumination to take full advantage of larger CCD chips and APSC DSLR cameras. The 100% fully illuminated field is 22 mm across, producing less vignetting across the field of view. 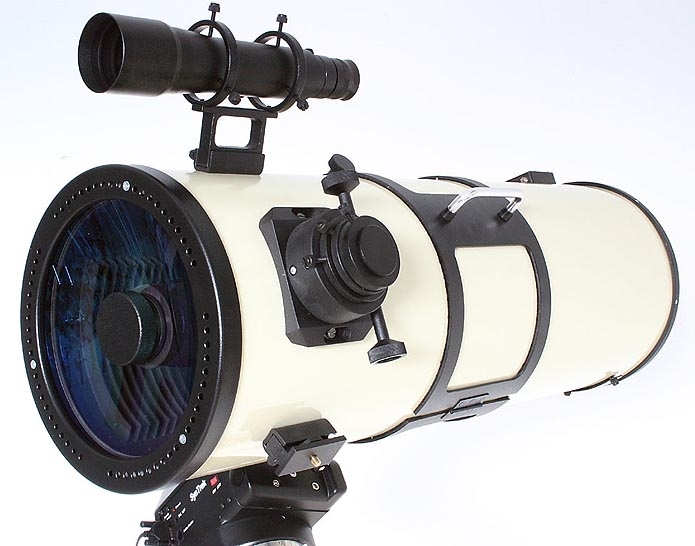 The Russian company Intes-Micro make a very wide range of premium Maksutov-Newtonian telescopes. They range in aperture from 127 through 152, 178, and 254 mm up to 305 mm. Details can be found on the ‘Widescreen Centre’ website: https://www.widescreen-centre.co.uk/. 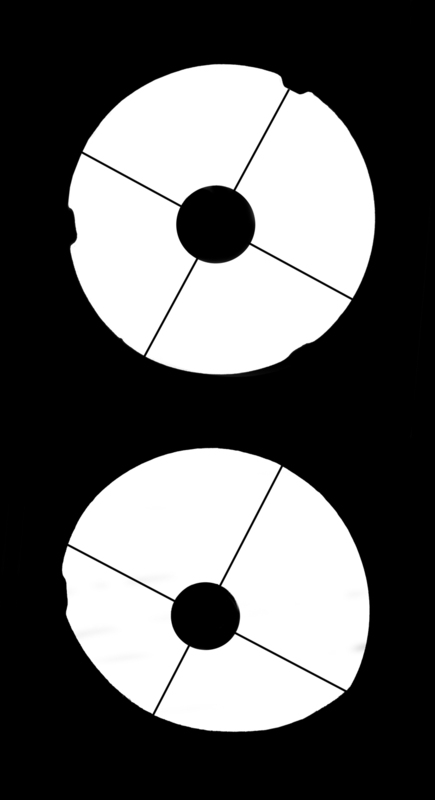 The smaller aperture telescopes can be obtained with either f/6 or f/8 (better for planetary observing as described above) versions. The larger telescopes are either f/5.5 or f/6. The telescope tubes are of larger diameter than one might expect as they contain numerous baffles down the tube interior as well as a set of baffles immediately opposite the focuser. These will help give the maximum possible contrast. The mirrors are specified to be equal or better than λ/6 peak to peak. A closed tube such as a Maksutov-Newtonian will take longer to cool down than an open tube Newtonian, but to reduce this to a minimum, a plate can be removed from behind the primary mirror and the periphery of the corrector plate has openings to let ambient air circulate within the tube and so reduce the cool-down time. The focuser is somewhat novel being a very low profile, short travel, model. This is good as it reduces the distance between the eyepiece or camera to a minimum and thus allows a smaller secondary mirror to be used. It incorporates two extension tubes to give a wide range of adjustment. A finderscope is included along with a camera mounting point. I have a very nice baffled metal dew tube to fit onto my MN66. 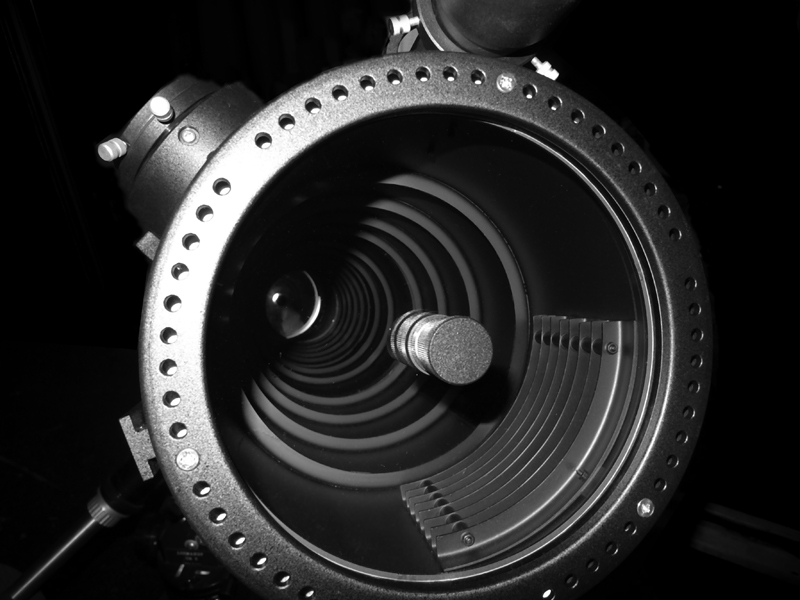 The interior of my Maksutov-Newtonian MN66 showing the baffles along the interior of the telescope tube and across from the focuser as well as the holes to allow air to leave or enter the tube around the corrector plate. 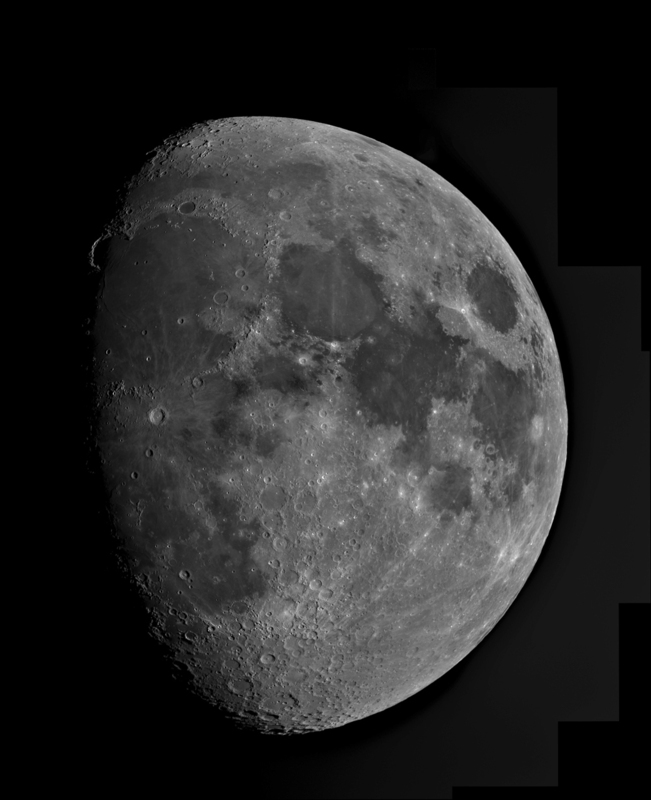 Imaging the 10 day old Moon with an Intes-Micro MN66 152 mm, f/6, Maksutov Newtonian. The night of February 25th 2018 was clear, but very cold. The 10 day old Moon became visible high in the south (at an elevation of 53 degrees) at about 8pm and so was an ideal target to image. This is a nice lunar phase as the terminator crossed the floor of Sinus Iridum so that the mountains on its western flank stand out against the black sky. I was imaging in the near infrared part of the spectrum using a Point Grey Chameleon webcam. The atmosphere is steadier in the near infrared so helping to give a sharper image. Happily, the Sony ICX445 sensor is still quite sensitive in the near infrared and, so to limit the bandwidth to the near infrared, an Astronomic ‘Planet IR Pro 742’ filter was screwed into the mouth of its 1.25” camera barrel. The webcam uses an array of 1296 x 964, 3.75 micron pixels to give a 1.3 megapixel image using a 12 bit ADC. Each frame thus provides ~3.9 megabytes of data at a frame rate of 15 frames per second. To cope with the real time storage of this data two external SSD USB3 drives were successively employed. I am very conservative about overlapping sufficient panes so that, in this case, the free program Microsoft ICE (Image Composite Editor) can be used to composite them into a full lunar disk. It is a truly wonderful program to use for this purpose. I thus took over 20 video sequences to cover the Moon’s surface each of 1,000 frames and carried out this process twice so having to store a total of 156 gigabytes of data! It turned out that the Point Grey imaging software limits each video file to 2 gigabytes, so for each pane, 2 files were produced. The processing of this data was identical to that employed in imaging the 6 day old Moon described in the Digest article ‘A Lunar Imaging Example using Deconvolution Sharpening and Microsoft ICE’ so does not need to be repeated here. It is helpful that I have an i7 processor based computer to carry out the Registax 6 processing of the video files! The full image is shown below along with full resolution images of two interesting parts of the lunar surface. The 10 day old Moon imaged on the 25th February 2018. 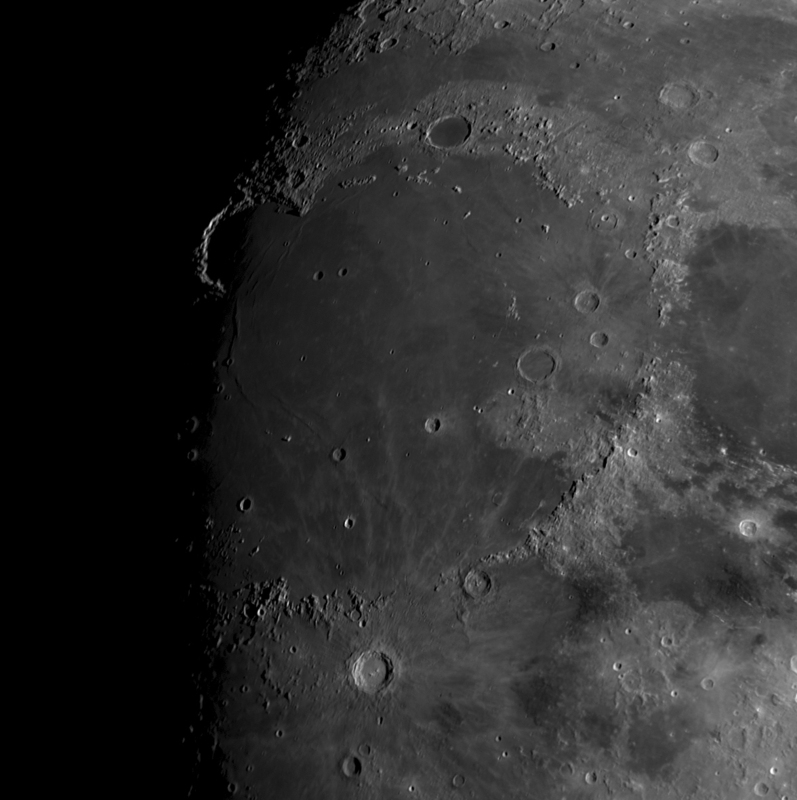 Mare Imbrium showing Sinus Iridum, the craters Copernicus and Plato along with the Alpine Valley cutting across the Apennine mountains. 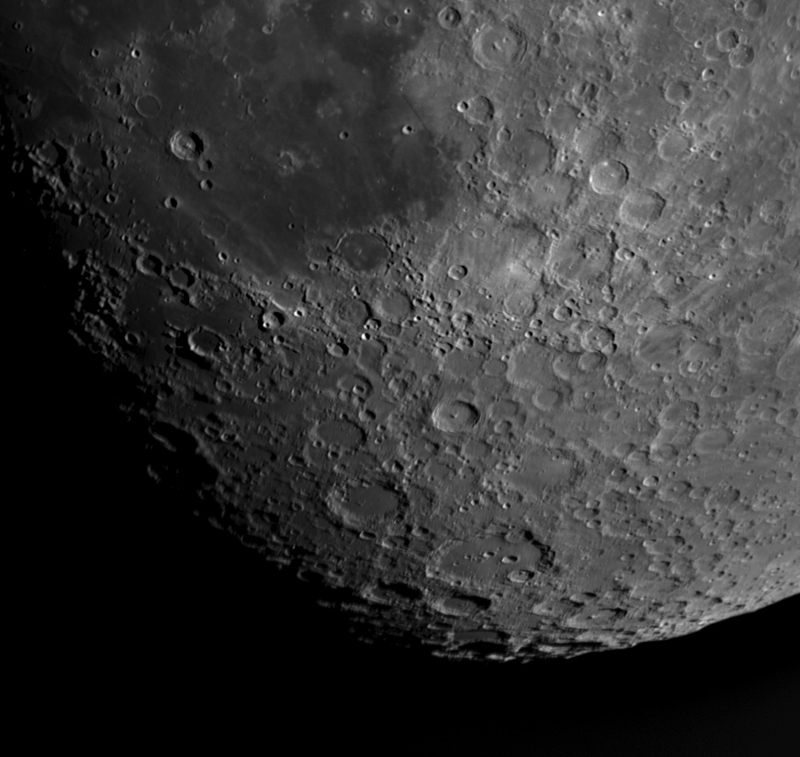 The Southern Highlands showing the craters Tycho with its ‘rays’ and, below, the wide crater Clavius with the arc of smaller craters within it.